Tommy Hilfiger showcases, in a series of new ads, the Tommy Hilfiger Adaptive collections for men, women and kids with disabilities. 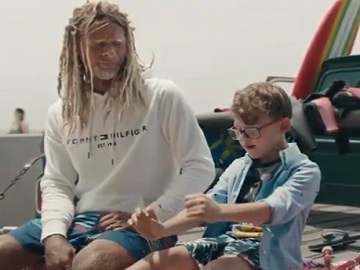 One of the spots, dubbed Independence 2019, features a diverse cast of real people with disabilities carrying out everyday activities, such as getting dressed (with clothes from the Tommy Hilfiger Adaptive collections), as well as pursuing their passions, such as dance and painting, and doing various sports, like surfing and skateboarding. The following message is delivered in voiceover by all these persons, including kids: “My advice is to think about people with disabilities in a different way. Remember that your disability is the thing that makes you unique. It’s something that you don’t have to hide. Not everybody has the strength to fight with everyday things like getting dressed. It’s about making everything easier for everybody. I can do this. You just have to rise up. We just keep going. Like, get up on the board and keep going. Keep going and never give up. Let people know what you dream about because you never know who can help you in your journey. My ability is stronger than my disability”. According to the brand, every collection is designed with and for people with disabilities to make getting dressed easier. Zippers can be done with one hand, shirts have discrete but strong magnetic buttons and tops boast easy-open necklines. Pants have extended openings to accommodate prosthetics or braces, jeans have adjustable features, as well as plenty of seated wear solutions. The Spring 2019 lineup for adults and children showcased in the video, which includes timeless essentials, fashion-forward looks inspired by the runway, as well as sporty, athleisure styles, is only available in North America.